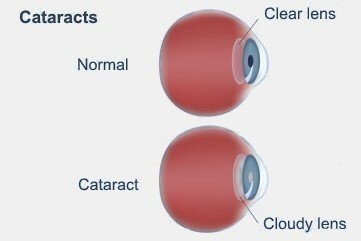 A cataract is when the clear lens in the eye becomes cloudy. This can lead to reduced vision. The lens of your eye works like the lens of a camera. It focuses the light onto the retina at the back of your eye. If the lens is no longer clear, light can't pass through it and your vision becomes cloudy. Cataracts are one of the most common causes of reduced vision but are easily treated. They usually happen with ageing, but there can be other causes. Cataract surgery is considered once loss of vision starts affecting your normal lifestyle. This varies from person to person and depends on how severe the cataract is. Cataracts are generally slow to form, and you might not even realise that one is developing. a frequent need to change your glasses. high levels of UV sun exposure. Age-related cataracts are the most common type. These develop slowly and can affect different parts of your lens. Certain eye conditions such as glaucoma or a form of inflammation called chronic uveitis can cause cataracts. So can health conditions such as diabetes, or side effects from drugs such as amiodarone and steroids. Cataracts can form after an eye injury. Some babies are born with cataracts, these are called congenital cataracts and may need prompt treatment. need to be "ripe" to be treated. generally cause irritation or pain. A cataract can't be reduced by diet or medication. An explanation of what cataracts are and their symptoms. Includes a printable information sheet. American Academy of Ophthalmology – What are cataracts? These pages explain what cataracts are, who is at risk, diagnosis, treatment and surgery. They include animated videos. Written by Canterbury optometrists. Endorsed by clinical director, Ophthalmology, Canterbury DHB. Last reviewed April 2018.